Do you need to do something about the broken television signal in your home? There’s plenty of reasons why you should choose a qualified antenna specialist in Hollywell. With an enviable location, many Hollywell residents may find themselves with diminishing signal due to rust or high winds affecting the antenna. In an old suburb like Hollywell, there is also a possibility that your antenna simply needs to be replaced. And why risk your health (as well as your home insurance) by doing the job incorrectly? Getting up on a roof is dangerous, especially if you have no experience and no safety equipment. Many homeowners think it is easy enough to get up on the roof and adjust the antenna, but if you don’t know what you’re doing, you could find yourself quite badly injured. Installing the wrong equipment can cause further damage. If you install an amplifier or antenna that your home doesn’t need or one that puts out more signal than required, you could damage the antenna or amplifier as well as your television. Save money. By choosing a qualified antenna specialist for your Hollywell home, you’re likely to save money in the long run. An antenna specialist can diagnose the issue correctly and then either repair or replace the piece of faulty equipment. If there is a need to install an amplifier, the antenna specialist can ensure you get the right part for your needs. Job done efficiently. If you’ve ever attempted to do something yourself instead of calling in the experts, you’ll know that in many cases, you spend much more time on a DIY than if you let a qualified tradesperson do the job. 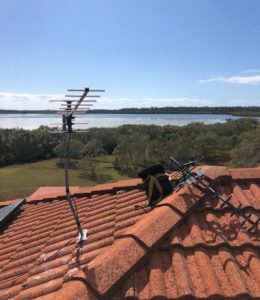 Why spend hours on a weekend trying to work out what is wrong with your television signal, when a five-minute phone call to Mantas at Home Style Antennas will start the process. Done right. Why risk needing to re-do a job that could have been done correctly in the first place? Why spend time installing new cables when the issue is that you need a replacement antenna? By choosing a qualified antenna specialist in Hollywell, you can be guaranteed that the job will be done right. Home Style Antennas can help you with more than just your antenna. Mantas can also assist you in installing the correct signal booster for your home, as well as wall mounting your television. If you choose a qualified antenna specialist in Hollywell, make sure it’s Home Style Antennas. With a free quote and a 10% discount for all new customers, you can’t go wrong.